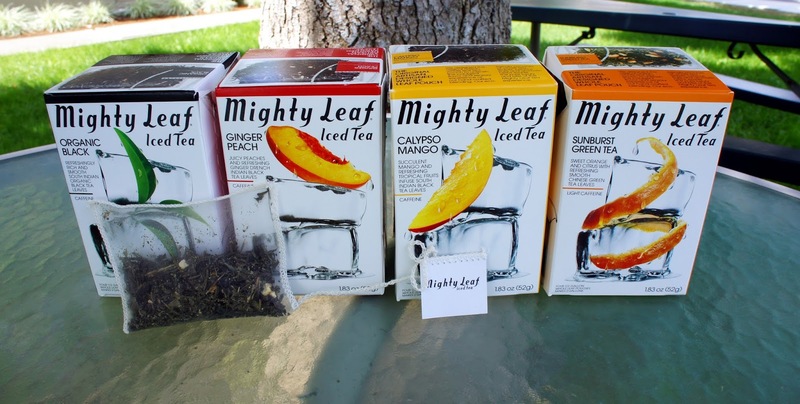 Mommy's Favorite Things: Mighty Leaf Tea Review! I'm a major tea drinker. I became caffeine intolerant a few years back so drinking coffee had to stop. I can have decaf once in a while, but anymore than that and it makes me sick. So I began drinking tea. Although some tea has quite a bit of caffeine in it, ALL tea has less caffeine than coffee :) That alone was enough to make me start drinking tea. I miss coffee at times, but waking up to a cup of black tea or green tea just makes the day so much better for me. I have at least 1 cup a day. So when I came across Mighty Leaf I knew I had to try their tea! You boil water (I use my tea kettle of course), put the tea bag inside the pitcher (it has a really long string on it too) and then pour the water in. You steep it for 5 minutes and then remove the bag. Then you fill the pitcher with ice and stir. I like the add honey and let that dissolve before adding my ice. The pitcher is really nice and has a nice screw on lid. You screw it open and open/close it more to adjust the flow of liquid. You can also close it all the way and store it in the fridge for a couple days before it starts going bitter. The pitcher is half a gallon and I find that it lasts me 2 days perfectly!! The tea is really really good too. My favorite is the Calypso Mango, the Ginger Peach is really nice too. Then I got the Sunburst Green Tea and the Organic Black. This is just their line of iced teas. They have regular loose leaf teas and other tea bags as well. For now I'm loving the iced teas. It's still in the 80s here so it comes in handy!! And it's a healthy drink, great alternative to soda that's for sure. Pour half of the Calypso Mango Iced Tea into another pitcher. Now your Takeya iced tea pitcher holds 32 oz. of Mighty Leaf Iced Tea. Add remaining ingredients, stir, pour over ice, enjoy! Pour half of the Ginger Peach Iced Tea into another pitcher. Now your Takeya iced tea pitcher holds 32 oz. of Mighty Leaf Iced Tea. Add remaining ingredients, stir, pour over ice, enjoy! Price: The Tea Bags are $5.99 for 4 bags, but again, each bag makes half a gallon!!! Overall: ***** love these teas! Very comparable to other 'expensive' teas I've had. Mighty Leaf Ginger Peach Fizz sounds yummy! I would totally make this! I would love to try the Mighty Leaf Ginger Peach Fizz using the Ginger Peach tea! I would love to have this Mighty Leaf Ginger Peach Julep and I would use Peach Green Tea to make it..
My favorite is Mighty Leaf Ginger Peach Julep made with Mighty Leaf Ginger Peach Iced Tea. I'd love to try the Mighty Leaf Calypso Mango Cooler with the Calypso Mango tea! The Mighty Leaf Calypso Mango Cooler sounds good to me. I would use the Calypso Mango tea. I would make the Mighty Leaf Ginger Peach Julep! I like the Mighty Leaf Ginger Peach Fizz, and I would use Mighty Leaf Peach Tea in it! The Mighty Leaf Peach Ginger Peach Fizz sounds great. My favorite recipe is good ole sweet tea & I would use the black organic tea to make it. Love the Mighty Leaf Calypso Mango Cooler recipe, but I might try it with Peach tea. The mango cooler sounds really good. I would make it just as directed. I'd like to try the Mighty Leaf Calypso Mango Cooler w/ the Calypso Mango tea, sounds good! The Mighty Leaf Ginger Peach Julep sound the best of all but they all sound good! Mighty Leaf Ginger Peach Julep sounds amazing and I would make it the same way! I'd use the mango tea to make the Mighty Leaf Calypso Mango Cooler. Sounds yummy! I'd make the Mighty Leaf Calypso Mango Cooler tea. I love the mighty ginger peach! Yummy! The Ginger Peach Julep sounds really good. I would use the Mighty Leaf Ginger Peach Iced Tea to make it. The Blacberry lime cooler recipe on their website sounds good too. You use their Organic Black Iced Tea to make that one. Never heard of or thought to make a Ginger Peach tea, the combination sounds good! I love the peach fizz recipe! I like the Mighty Leaf Calypso Mango Cooler and I'd use the Mighty Leaf Calypso Mango Iced Tea. 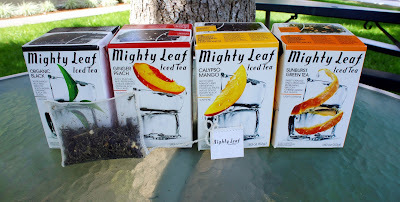 I'd love to try the Mighty Leaf Calypso Mango Cooler with their Mango tea bags. I'd like to do the Ginger Peach Fizz with the peach tea! I'd make sweet tea with their peach tea! My favorite recipe is the mighty leaf calypso mango cooler and I would make this with the mango tea. Mine is the Peach Fizz and I would use the Ginger Peach tea. The ginger peach tea one sounded yummy! They all sound refreshing but I think i'd definitely try the Peach Fizz first! Mighty Leaf Ginger Peach Julep Love this one! I would make a Ginger Peach apricot tea. I would use the Ginger Peach Iced Tea and Apricot Nectar ice cubes. Mighty Leaf Calypso Mango Cooler with the mightly leaf mango tea. I would definitely use make the Mighty Leaf Ginger Peach Fizz. I would like to make the recipe for Mighty Leaf Ginger Peach Fizz with the Ginger Peach tea. Mighty Leaf Calypso Mango Cooler recipe with peach tea. Mighty Leaf Ginger Peach Julep and would use the Mighty Leaf Ginger Peach Julep tea. I'd like to make the Mighty Leaf Ginger Peach Fizz with the Mighty Leaf Ginger Peach Iced Tea. I would love to try the Mighty Leaf Ginger Peach Fizz. My favorite recipe is GINGER PEACH APPLE SLING & I would use the ginger peach tea.